Has it ever crossed your mind that maybe what you are putting into your body isn’t quite right for you? Or if there was a more organic alternative? 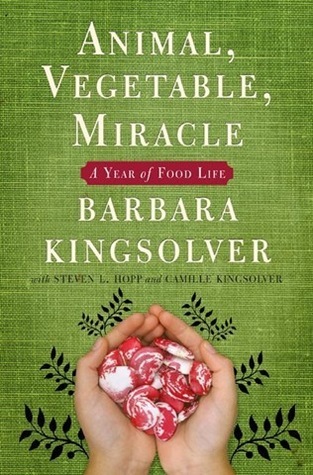 The answers to these questions can be found in Animal, Vegetable, Miracle by Barbara Kingsolver. You see, this book goes head on to tackle many issues in regards to how and why organic food surpases its induistrial counterpart. She even goes further to talk about how the harsh realities of what goes on in CAFOs. In my opinion, the best part about it is that she goes about doing so by delivering the tale of what her and her family go through as they work on their own organic garden over a year’s span. One of the main points I took from this book was how the quality of local grown food surpasses food from an industrial grown competitor. I believe this is represented best by how she illustrates the experience that Barbara and her family went through. For example, Barbara Kingsolver and her husband, Steven L. hop, move from their home of Tucson, Arizona to live off the land in a rural area in the Appalachians. Once arrived and the garden was ready for harvest they continued to primarily just eat from their own organic garden, her daughter Camille even provided complete recipes of what they ate. She really opened my eyes when she talked about how harsh CAFOs are with their treatment of the animals the proceed to butcher for the food we ate. This was best represented when she said, “The ve-vangelical pamphlets showing jam-packed chickens and sick downer cows usually declare, as their first principle, that all meat is factory-farmed. That is false, and an affront to those of us who work to raise animals humanely, or who support such practices with our buying power. I don’t want to cause any creature misery, so I won’t knowingly eat anything that has stood in its own poop wishing it was dead until bam, one day it was.” (Kingsolver) To me, this really showed her compassion for animals while at the same time acknowledging that maybe we should think twice about the burger we are about to put in our bellies. That maybe that burger is hurt our insides instead of providing nutrients we assume we are getting. My overall impression of this book was nothing but the highest merit. It was as equally entertaining as it was informative, a quality i often find lacking in a non-fiction book like this one. It completely opened my eyes to many things in the food industry that would normally just flash on by with my recognition. Even to the point where it makes me want to rethink my own personal diet. I plan on recommending this book to friend or family member so that it can have the same impact on them as it did on me. Kingsolver, Barbara. Animal, Vegetable, Miracle: A Year of Food Life. New York: Harper Collins, 2007. Print.